Attorneys for Jared Loughner, who's accused of murdering six people and wounding 13 during an Arizona shooting spree, have been arguing that doctors in the Missouri psychiatric facility where he's being held shouldn't be able to force him to take his medication. His doctors say that the medication could make Loughner fit to stand trial, and now a judge has ruled that they can continue to make him take it. 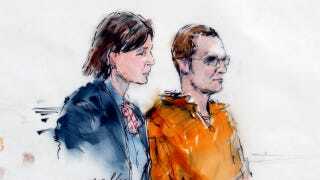 The Associated Press reports that in a three-hour hearing on Friday, U.S. District Judge Larry Burns reviewed Loughner's recent behavior and said that the drugging, "seems entirely appropriate and reasonable to me." In May Loughner was diagnosed with schizophrenia and declared mentally unfit to stand trial. After determining that he was a danger to those around him, doctors forced him to take medication between June 21 and July 1. After going off the medication, Loughner kept himself awake for 50 hours and refused to eat, losing 9 pounds. He also paced until he developed sores on his foot, then refused to take antibiotics to treat an infection that developed. On July 18 doctors determined that Loughner was a danger to himself and started medicating him again. Psychlogist Christina Pietz told the court that Loughner is "less psychotic" — but now she's worried about his depression. He sometimes sobs uncontrollably during sessions, covers his face, and complains that he has no control over anything in his life (considering where he is, that isn't surprising). Defense attorneys had asked to start monitoring Loughner's psychiatric assessments ia videotape, but Pietz said the presence of a camera worsened his symptoms. "The first time, he was so psychotic that he became enraged with the video camera," she said. According to the Arizona Republic, the defense's request to see videotapes of how Loughner's being treated led to a shocking revelation. Though he's on suicide watch and his cell is monitored by video at all time, there are corners of his cell that aren't visible on camera. Prosecutors said they were worried that if the defense saw the tapes, they could tell Loughner where he couldn't be seen and "defeat the whole point of the surveillance system." The judge denied the defense's motion to review tapes of his treatment.